Systems, filter components and controllers for extracting gases, vapors, fumes and dusts in order to reduce emission in foundries, e.g. at casting lines and casting equipment by means of housings or extraction hoods. 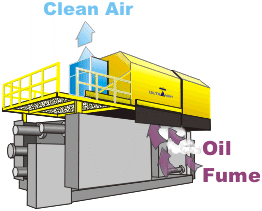 The fume extraction system can collect and extract contaminated air directly at the source. The extraction is usually combined with dust removal. Roof-mounted ventilation systems or exhaust ducts installed under the roof of the factory hall have proven to be insufficient as vapors emitted by the production machines are distributed inside the hall before they are extracted and discharged by the ventilation system. When extracted from casting and cooling lines, the exhaust air is treated according to its dust content and chemical composition. Die casting machines are fitted with movable or pivoting extraction hoods that are equipped with filter systems for separating dust, casting fumes and vapors of separating agents (Fig. 1 & Fig. 2) shows a schematic representation of a Pressure die casting machine. Here, the exhaust air containing fumes from the die casting machine is thoroughly purified and returned to the factory hall. This reduces the high energy costs involved in air exchange by over 80%. 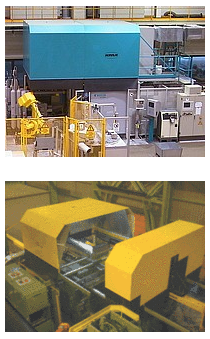 At the same time, the foundry’s “carbon footprint” is improved, e.g. for a medium-sized die casting machine (800-900t), CO2 emissions are reduced by more than 25t per year thanks to the savings in heating energy. The most widely used filters are demisters consisting of a stainless steel wire mesh provided with a special shaping that allows for a high separating capacity for aerosols, droplets, and mists, and electrical and mechanical filters. The latter are available as pre-filters (filter grade G) or as high-performance primary filters (filter grade F) and HEPA filters (filter grade H) with outstanding collection efficiency.